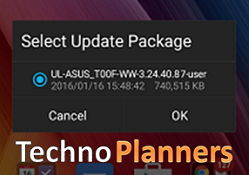 Tutorial - How to Update ASUS Zenfone 5 in 3.24.40.87 Lollipop firmware. Recently ASUS release there latest firmware for Zenfone 5 A500CG and A5001CG device model. Your device must run on 3.24.40.78 firmware before updating. Otherwise System Update can be fail. In preview Post we talk about How to Root Zenfone 5 in 3.24.40.87 Lollipop Latest firmware. First Download 3.24.40.87 firmware according to your device SKU. for example if your device running on WW SKU you have to download 3.24.40.87 WW sku firmware from end of post. After Download, Connect your zenfone with PC using Data cable and Copy firmware zip file in device internal storage. Now disconnect your zenfone, you will see a System update file detected notification. Just tap on it. Then select update package and press OK button then again press OK button to start. After Press OK button It will reboot and Start Install System Update file on your device. It can be take 15 - 20 minutes to complete. Congratulations, After its done you can use your device in update 3.24.40.87 Firmware. You can also check out How to Install ZenMotion Wake/Sleep on Asus Zenfone 5 and Zenfone 6. Don't forget to Share this tutorial. I have a question. I have rooted zenfone 5 3.24.40.78 . Is the root acces will missing if I do this update? Can we root latest firmware. 87 with same one click root? Can I downgrade this version with the older version of android? I don't pretty like it because my battery draining so fast using this kind of android. May I have the link for android KitKat firmware? I don't find the right firmware. Thank you. And I'm using WW firmware. No notification pleae help? I already placed the zip file in the iternal storage but theres no notification pleaee help? The sim card unavailable for me.